Alternative Album Of The Year nominees include Grimes, Weaves, Dilly Dally, Black Mountain, and July Talk. Artist Of The Year could be Drake, Alessia Cara, Leonard Cohen, Shawn Mendes, or the Weekend, while the Breakthrough Artist Of The Year field comprises Andy Shauf, Kaytranada, Jazz Cartier, Ruth B, and Tory Lanez. Losing to Drake in the Rap Album Of The Year category will be Tory Lanez, Belly, Jazz Cartier, and Tasha The Amazon. And the International Album Of The Year, recognizing artists from outside Canada, could go to Rihanna, Sia, Coldplay, One Direction, or Ariana Grande. Tegan And Sara grabbed a nod for Pop Album Of The Year and Group Of The Year, while sisters Tegan Quin and Sara Quin are up against Leonard Cohen and Gord Downie in the Songwriter Of The Year department. There are many more nominations to pore over here. 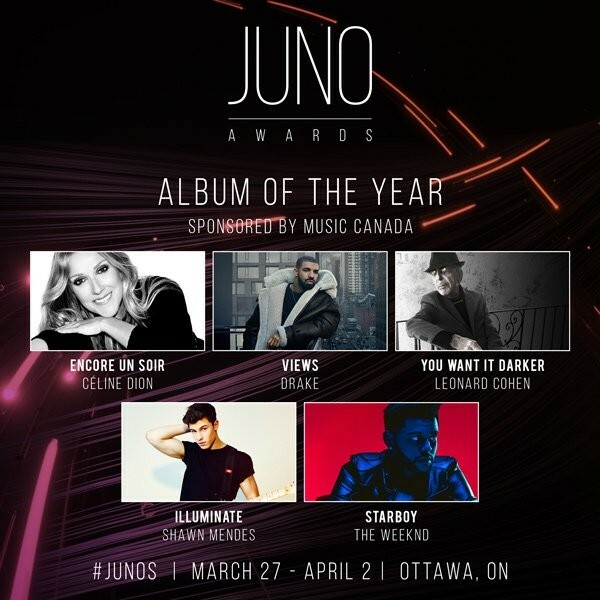 The Junos will take place 4/2 in Ottawa.